As you may know, this year's WKC goes back to the home of Kendo - Japan! 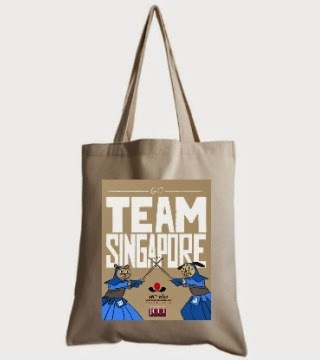 To raise funds to send our dedicated team of Singaporeans to Tokyo, we are producing several pieces of merchandise that you voted for! Each purchase goes a long way towards covering some of the costs that each of our hard-working Kenshi has had to bear in order to train and, ultimately, compete with the world's best. Each of these merchandises bear the image of a lion, the symbol of Singapore. So when you prepare for keiko or shiai, look upon your tenugui, and put on the heart of a lion; when you wear your polo t-shirt, be bold and brave like a lion! Don't just buy one for yourself, share them with your pack - these products make great gifts and souvenirs as well! Sale counters will be set up at Changi Dojo every Sunday until 12 April. Supporter Package A ====> Polo Tee + Tenugui ~ $40. Special discount for every Ultimate Supporter Package ordered, get a maximum of two additional items: Polo Tees @ $26 ($4 off!) and/or Tenugui / Tote Bag @ $12 ($3 off!)! Only on 22 & 29 March ONLY. All orders and payment must be made in CASH at SKC dojo. Products will be ready for collection end-April to mid-May 2015. You may continue to place orders through Grace Lim until 12 April 2015. Each club will have received your order forms via email. You can collate your orders within your club and submit them via email to Grace Lim. Affiliate clubs will continue to enjoy discounts for orders received before 12 April 2015.